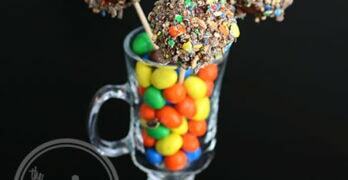 I’ll be the first person to admit that I have a sweet tooth. I can’t help it – sometimes I just feel like having that extra little kick of sweetness, whether it’s for an afternoon treat or a reward after a long day at work. Have you ever felt that way? According to Today Show Food Editor Phil Lempert, YumEarth Organic Lollipops were the best lollipop he’s ever tasted. After sampling some of their eight delicious flavors, I can’t say he’s wrong. 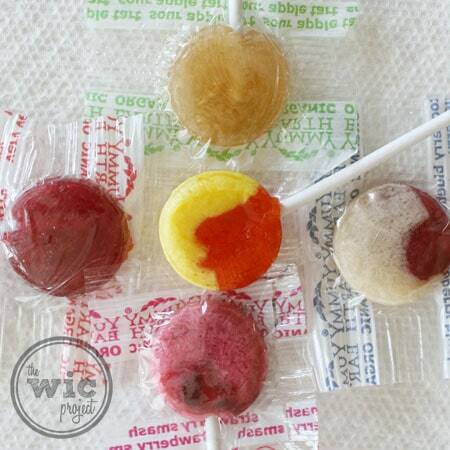 The YumEarth Organic Lollipops come in some of the “traditional” flavors, such as Strawberry Smash and Very Very Cherry, but the also kick it up a notch with some hipper flavors, like Mango Tango and Pomegranate Pucker. I loved the balance of sweetness and tartness, all while still getting 100% of the Daily Vitamin C per serving. While a serving is 3 pops, 1 pop is a nice treat, with just 22 calories. The YumEarth Organic Lollipops, as well as the YumEarth Gummy Bears, are made using real fruit extracts and 100% natural flavors. They are fat-free, dairy-free, soy-free, gluten-free, and artificial-free. I love that. The YumEarth Gummy bears come in convenient snack packs. 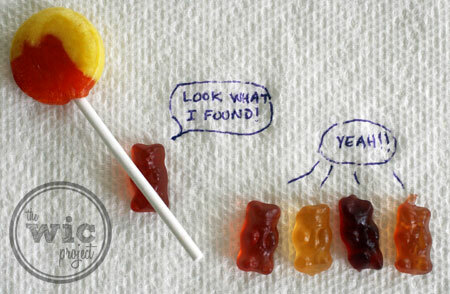 There are three different flavors of Gummy Bears – Pomegranate Pucker, Strawberry Smash, and Sour Apple Tart. I thought that Strawberry Smash would be my favorite flavor gummy bear, but was pleasantly surprised by both the pomegranate and apple bears. Delicious! I believe that candy should be a treat, not a diet staple, but I feel better knowing that YumEarth Organics candies don’t have any weird chemicals or artificial ingredients. Keep an eye out for YumEarth Organic Lollipops and Gummy Bears – they’re hitting Target shelves this summer! 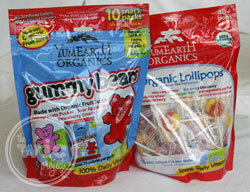 YumEarth Organics Gummy Bears and YumEarth Organics Lollipops are made with real fruit juice and other planet-friendly and natural ingredients. They contain no artificial colors or flavors, no major allergens, such as gluten, nuts and dairy and no high-fructose corn syrup. Each serving provides 100% of daily vitamin C and has less than 70 calories. One winner will receive a bag of YumEarth Organic Lollipops. This giveaway is now closed. Congrats to our winner: Entry #967 Jenny Q.
Disclaimer: This review was made possible by Mom Spark Media. Thoughts are my own. All prizing for MSM giveaways is handled by a third party unless otherwise noted. For this reason prize fulfillment can take up to 90 days after the winners information is received. The Pomegranate Pucker sounds good! I’m very very cherry girly! Ooooh, the very very Cherry sounds good. Very Very Cherry is the one I want to try the most. I can’t wait to try pomegranite pucker. Thanks so much for the contest. I would love to try Pomegranate Pucker. Smooch! Thanks for the chance. I really want to try strawberry smash. I want to try Pomegranate Pucker! I can’t wait to try the Pomegranate Pucker. I love cherry suckers so I would like to try that flavor. I am really into pomegranate. so pomegranate pucker. I wouldlike to try their Pomegranate Pucker Lollipop. we tried these and loved them! Very, Very Cherry! 😀 How awesome! Thanks for the giveaway! Blue Strong on FB! I love their lollipops! I bought a huge container that has surprisingly lasted me a long time. The cherry is great! Sour Apple Tart–huge fan of all things apple! Now I can feel ok about giving my grandson sweets! Love these and never feel guilty about giving them to my kids!!! I’d like to try Strawberry Smash! I want to try the Sour Apple Tart! I’d like to try the Strawberry Smash. I would love to try the Sour Apple Tart. I want the Wet Face Watermelon! Just bought a bag the other day at winners, at the recommendation of a friend…Mango Tango…YUMMY!!! I’d take more of these any day! I cannot wait to try these. Pomegranate Pucker sounds good to me!! I love their lollies but would actually love to try their hopscotch butterscotch ~thanks. I’d love to try the Very Very Cherry flavor. I really want to try the pomegranate pucker flavor! I would like to try the Mango Tango flavor. I would love to try Very Very Cherry! I like the strawberry smash! Strawberry Smash would be my flavor of choice! I’d really like to try the Strawberry smash! I would love to try the very very cherry!